If you ask me I'd go for a GT2 base on its upgrades the only thing that makes this Porsche GT3 RS an option for us is the price that cost £104,841, which is far cheaper than the GT2. 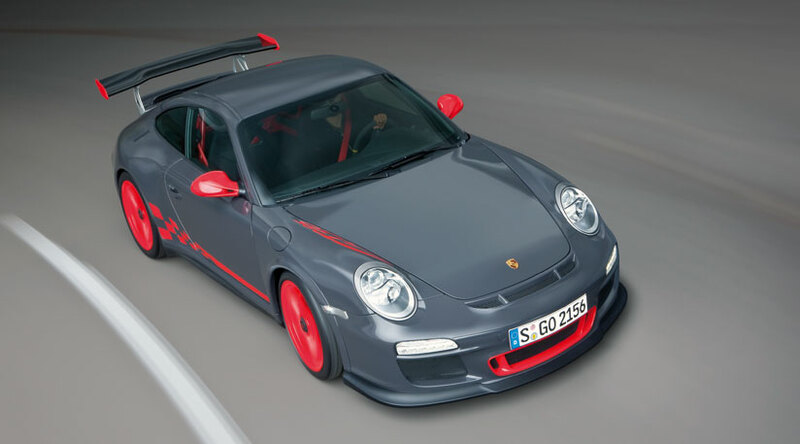 The upgrades made for the 2010 Porsche GT3 RS are the engine which they've changed it to a 3.8 liter flat six compared to their older 3.6 liter combined with a motorsport derived 6 speed manual which is the only option for this supercar, that enables this car to produce an improved 444bhp at 7900rpm compare to its previous model but the torque power remains unchanged with 317lb ft. which will be produced in higher revs and let's this GT3 accelerate from a standpoint to 62mph in 4.0 seconds and reaches a top speed of 193mph. Light weight modifications are also applied to this GT3 so expect a lot of carbon fibers involved. In my opinion I'm really disappointed with the upgrades made for this new Porsche GT3 RS, it's totally inefficient increasing the engine displacement to a 3.8 liter and only resulting to a 15bhp increase at a higher rev of 300rpm and achieving the same torque power of the previous model if high revolutioned obviously you'll consume more fuel just to be up a bit over the previous model, and I really do expect much more knowing that the displacement has increased and getting a 4.0 seconds acceleration and a top speed of 193mph nowadays isn't something special enough to be proud of.